New program will pay off your student loan up to $40,000. First time home buyers when you purchase a home in Maryland if you have student debt of $1000, your student loan will be paid off when you purchase a home. 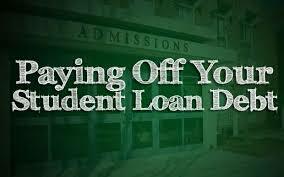 MD will pay off 15% of the sales price, $37,500 of your student debt at closing. You can also receive $5000 in down payment assistance. The program is available while funds last. • Borrower is an honorably discharged veteran who has not previously used the first-time home buyer exemption. Homeownership for Individuals with Disabilities Program provides assistance for low income households with a disabled family member. Income and home price restrictions apply. For a limited time, eligible home buyers with student loan debt who make a purchase in one of Maryland’s Sustainable Communities can receive a 0.25% reduction in their Maryland Mortgage Program mortgage rate. Maryland HomeCredit empowers homeowners to receive a federal tax creditequal to 25% of the annual mortgage interest payments (up to $2,000) per year for the life of the loan! These benefits end when you sell, refinance, transfer or pay off your original mortgage. Maryland Homefront provides a 0.25% discount on your fixed mortgage rate for veterans and active duty military. This discount is an expression of appreciation for the sacrifices made by members of the military and their families. This can be used with the Maryland Mortgage Program’s Down Payment Assistance Program! Down payment and closing cost assistance assistance from various sources. In addition to your interest-free, deferred loan of up to $5,000 from the state, you may also be able to receive additional assistance from other partner programs. Low interest rates that are often lower than commercial lenders. Free and low-cost homebuyer education courses. Maryland Mortgage Grant Assist can cover up to 4% of the amount of the primary mortgage. This grant can be used for down payment and closing costs. However, it does not have to be repaid. Maryland Opportunity Grant is a product offered by the Maryland Mortgage Program (MMP). If you meet certain income criteria and use an MMP Freddie Mac conventional mortgage, you may receive 2% of your home’s purchase price in a grant for down payment and closing costs. Anne Arundel County offers up to $20,000 toward the purchase of your home through their Mortgage Assistance Program (MAP). Buying Into Baltimore can provide $5,000 toward the purchase of a home anywhere in Baltimore City. City Living Starts Here provides a limited number of incentives for purchases in specific neighborhoods. Community Development Block Grant Homeownership Assistance Program also provides $5,000 in down payment and closing cost assistance for qualifying low income home buyers. Live Near Your Work Program provides an employer matching program. This program can contribute up to $2,500 toward the purchase of your home. Click here for a list of participating employers – and note that the Johns Hopkins Live Near Your Work Program offers up to $36,000 toward your home purchase! Project Reinvest: Homeownership program that provides up to $10,500 in down payment and closing cost assistance. This benefit can be combined with the Maryland Mortgage Program (MMP)! Vacants to Value Booster Program can provide up to $10,000 toward your closing costs if you’re purchasing a home that was previously unoccupied. Baltimore County provides up to $10,000 to low income households. These funds can be used to help pay closing costs when purchasing an existing home within the Community Conservation Areas of Baltimore County. Frederick provides many homebuyer programs also. They provide homebuyer education classes, weatherization assistance, CPIP down payment assistance and a special program for city employees. Gaithersburg provides a Homebuyer Assistance Loan Program (GHALP) that can contribute $12,000 to $25,000 toward the purchase of your home inside the corporate limits of the City of Gaithersburg. Hagerstown also participates in some homebuyer programs. A down payment and rehabilitation program is available for buyers who are purchasing a home in City Center or other city locations. The Homeownership Program offers renovated homes for a low price to qualifying buyers. Harford County provides a first time home buyer program that includes homebuyer education classes. It does not appear that financial assistance is included in this program. Howard County provides down payment assistance to qualified home buyers. Montgomery County partners with the Maryland Mortgage Program to provide up to $25,000 in down payment assistance to eligible first time home buyers in Montgomery County! Prince George’s County offers up to $10,000 in down payment assistance through their “Pathway to Purchase” first time home buyer program.